Assumptions, don’t you hate them? Like when you assume you won’t need that dinner reservation on a Wednesday night and you find yourself having to wait at the bar for half an hour. Or when you assume you will win lotto this week and you tell your boss what you really think about his comb-over. Or when Maps tells you that you will arrive at your destination in 20mins and you are still in traffic 45mins later. Wait what do you mean the app doesn’t know about morning traffic? 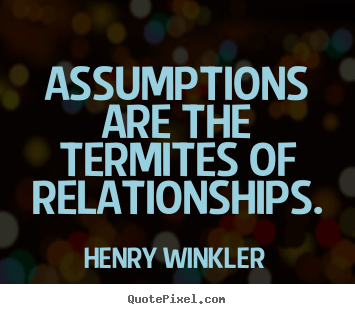 We make assumptions all the time…. like the assumption that you are making of where this blog is going. There are assumptions and there are assumptions, you know what I mean? I am going to assume you don’t. Some assumptions are so small that they don’t matter and others can be damaging. So you see, suppositions and I don’t get along. When I worked in the produce industry the importance of dealing with facts was paramount. I was in the business of buying and selling large amounts of fresh produce mainly from growers to supermarkets chains. Trust me, when you are dealing with a dying product by the truck load and with a huge amount of someone else’s money, information gathering important. When I first started (I refer to this as my young and stupid stage) I took what people said as fact. I would ask a market agent for a price, he would give me one and I assumed that was solid information. I would then ask for his expected volumes in and again, I would assume that was also solid information and then I would make assumptions based on several different conversations of this nature. Truer words were never spoken. As you can imagine, when I based decisions on something I heard from someone else, I was eaten alive. Pretty soon I realised that to gage the market on any given product, required a lot more questions. I learned to firstly deal directly with the grower, ASK THE SOURCE – what a novel idea. I’d then inform myself of the expected volume, quality, price movements, demand and what was happening in the different growing regions. I’d find out what imported product was due to arrive that could affect the market. I drove or walked around the entire market to see for myself, oh yes I was a total creeper; I drove slowly as the forklifts loaded and unload product. Weather plays a big (unpredictable) part in the produce game. A severe storm, frost, hail or heatwave can change the market overnight and a full moon is likely to bring on a flush of product. Asking a thousand pertinent questions and looking at the question from all possible positions – that is gathering solid information. You are probably wondering, what was the point of that short glimpse into the world of Produce. My point is that only after asking an INSANE amount of questions was I in a position to make a safe assumption. There is always an element of assumption when negotiating. They could be holding cards you don’t have access to but believing what one person tells you, without taking the time to learn the facts or see for yourself, to use a kind word, is naïve. Facts are important, data integrity is important, doesn’t matter where you work basing your word on facts is always the right way / safe way to conduct business. It’s also the smart thing to do when dealing with people you don’t know. No, I know what you are thinking. I am not suggesting you run a full on investigation on every person you meet. To do that would just be weird and then you miss out on the fun of discovering new things about someone through conversation and personal contact. The only way to know who you are dealing with is by taking the time to know them. Read the book before you publish a review. On a personal level I am fairly trusting with people in my inner circle. I believe I have always had a reasonable level of emotional intelligence and usually find a way to understand where people are coming from. When someone behaves uncharacteristically it’s only fair to take the time to find out what is really going on before telling them to go jump off the harbour bridge. After all I would hope they would do the same for me. It doesn’t mean I don’t get hurt. It’s impossible to be calculating when your heart is involved; love is blind and all that. I am however, empathetic and when I draw an assumption about someone, you can rest assure I have done my homework. Getting to know people takes time and much like dealing with produce there are always a million contributing factors. Now we all know that some jerks ARE just jerks. Others times our friends behave like jerks because they are fighting a battle we don’t know about. It’s hard to say we ever really know someone but sometimes we are lucky enough to have people look us in the eye and be real. Other times they look us in the eye and your heart tells your gut to mind its own business because it knows! It knows that something doesn’t add up. I believe in trusting people, going by this post you might be swayed to think otherwise but I do. There are people I trust completely and I trust them because they have earned it and I KNOW them. They have at some point given me a chance to see the inner working gears of their heart and mind and I have liked what I have seen. Other times my gut warns me that I might need to know more. Step back a little and try to really look at someone from a different view point. How do they treat their siblings, parents, and friends? Do they kick your cat when you are not looking? What do other people say about them? What does he/she say about you when you are not around? Trust is earned and developed through time and information and feelings. Their story would have moulded them to the person they are today. Just because your partner can cheat on you doesn’t mean that they will. Just because someone left you for higher income bracket don’t mean everyone will. Just because you didn’t know something about your friend doesn’t mean they are hiding things from you, it could just be something hard to talk about. Just because you don’t hear from someone within the space of 24hrs doesn’t mean they do not care about you. I have seen friends drive themselves crazy and out shine any government agency with their social media research / stalking skills. When asked what happened when they confronted the person about their suspicion they confess they haven’t had the guts to ask. If doubt is eating at you, you should trust that and ask the person involved what is going on. Sometimes you find out that people you let in are not who you thought they were. Other times they are exactly who you fell in love with or exactly the friend you have known for years. You can’t control that but you can be a trustworthy person who likes what they see when they look in the mirror every day. No time for facts? Have you heard of common sense? If she is cheating on her current boyfriend with you because you mesmerised her with your rock hard abs, that speaks to her character and I would be careful of shinier men. If he doesn’t ever text you back or text you first, that speaks to his level of interest. If he hit you once, he may hit you again. If she has told you that she never wants to have a child, that doesn’t mean with her ex, it means she has no interest in being a mother. If you have a question – ask THEM straight out. Know their story; do your homework and know why they are who they are. Know their guts! Listen and absorb what they are saying to you. Don’t pick and choose which of their answers suit you and discard the rest. Don’t turn a blind eye when they treat someone maliciously and hope they will change. Your fantasy version of someone is not really them. When you don’t do your homework and leave everything up to assumptions you are only robbing yourself of the truth.